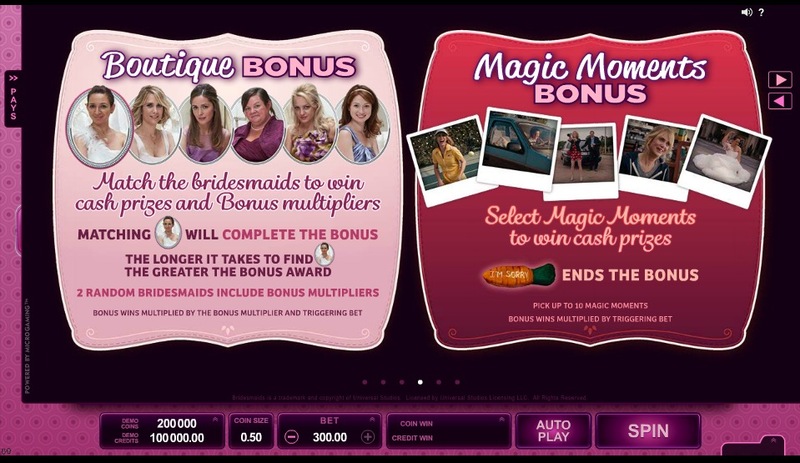 Save the date for Bridesmaids, an online slot game created in 2015 by Microgaming and adapted from the Universal Pictures film. 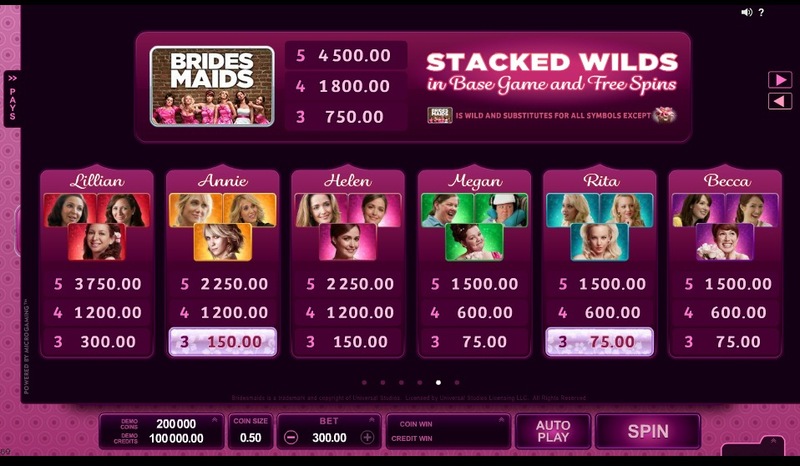 Bridesmaid gives you the opportunity to get your 15 minutes of fame as you’ll join Annie and Lillian on their march way down the aisle, along the 5 x 4 reels and 40 paylines the game has to offer. 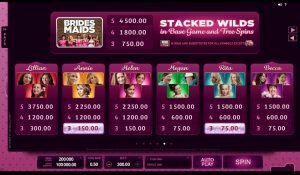 In its appearance, Bridesmaids online slots version clearly sticks to its romantic comedy eponym, with pink background, light green and blue frames colours, and stylish handwritten fonts. 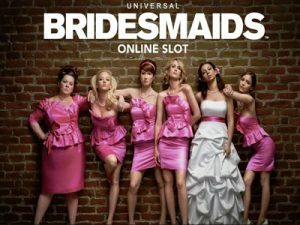 Bridesmaids is indeed a chick flick, the game slots designers didn’t try to reinvent the wheel here. Still, the design is neat, and the use of the actresses pictures as symbols on the reels procures both freshness and credibility. 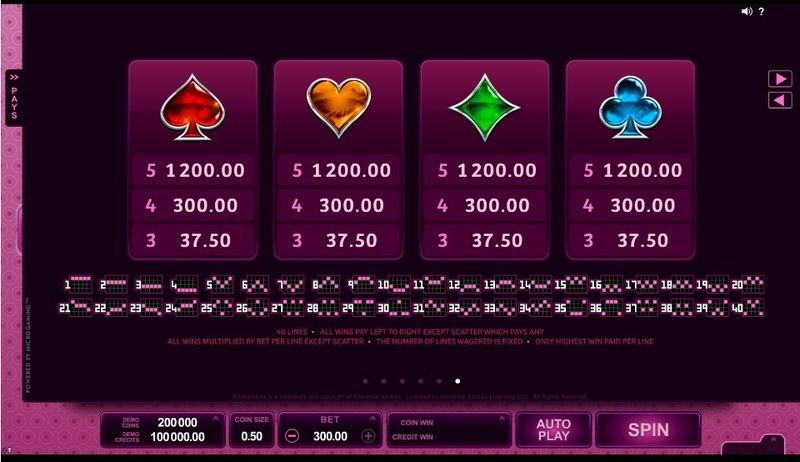 Other symbols are spades, hearts, diamonds and clubs; a smart way to link this movie queens to the casino universe. 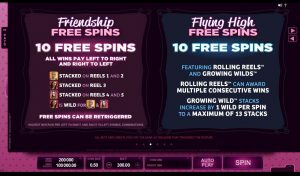 When hitting a winning combination, the game will congratulate you with the typical casino slot jumpy tune, with more reverb and a higher pitch than usual, adding to the girly movie experience. 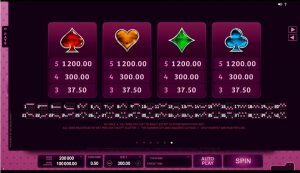 If you’re new in the world of online casino, or you are not fully accustomed to Microgaming slots, you can use the menu on the bottom right of the screen to adjust video and sound settings, check the game statistics or read the user manual. 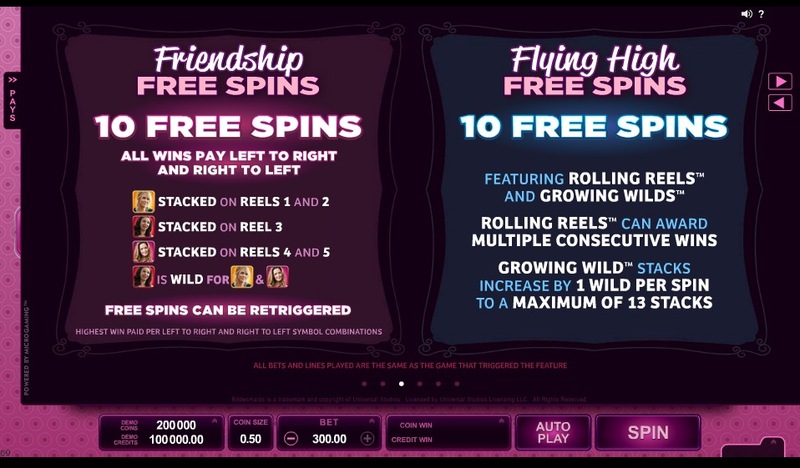 The other menu on the right side is a must read as it describes all the paylines, free spins, scatter symbols and bonuses. 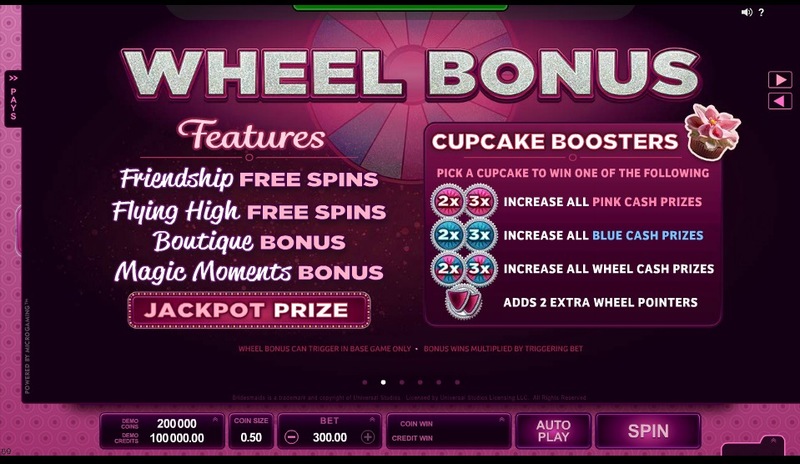 While you can win good amounts of money with Bridesmaid, the minimum bet being fixed at £0.40. Gains go higher when raising the bet of course and the alignment of minimum 3 of the movie female character symbols. Honour to the bride there and an exciting £3750 maximum win for 5 Lilian’s pictures, just under the movie poster symbol at £4500. 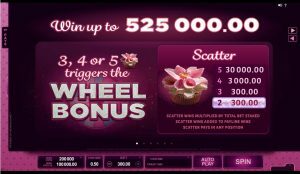 The scatter wedding bouquet symbol and its £30000 profit will temper your hesitations on the idea of getting married, especially as it also triggers the Wheel Bonus. 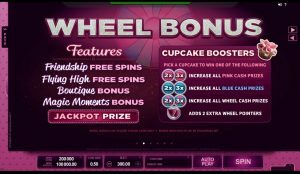 The Wheel Bonus is a strong feature of this game, unlocking 2 different types of free spins, 4 kinds of cupcake boosters to time your cash prizes by two or three, 2 Boutique and Magic Moments Bonuses, and the Jackpot prize of course. 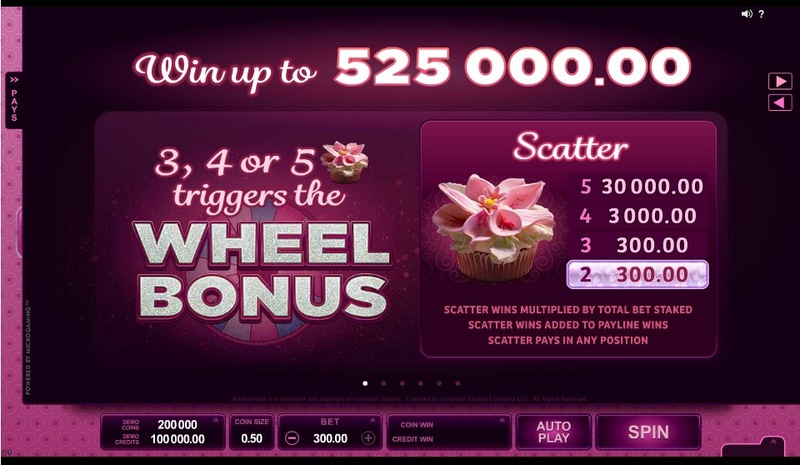 With maximum gains up to £105 000.00, Bridesmaid has surely something of a life turning point if luck finds you.